Tissue box covers make an excellent gift for just about anyone! During our CYBER WEEK SALE we’re giving you a 15% discount on our newest pattern – covers for tissue boxes! No coupon code is necessary – prices are already marked down. The DIY Tissue Box Cover pattern has full size pattern pieces for all three tissue box sizes – large rectangle, short rectangle and square. Tissue box covers can be made out of remnant fabrics, so dig into your scrap box and start creating some great Kleenex box covers. 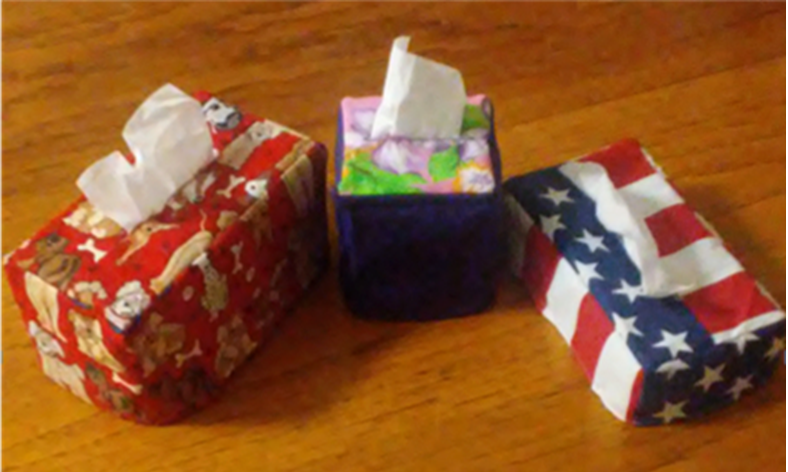 You can make sports related tissue box covers, patriotic covers, favorite pet fabric covers (these are a HUGE success! ), nursery room tissue box covers, and that’s only a beginning. For all those that do sewing and alterations and have a customer waiting area, I would suggest you make some fall, Thanksgiving and Christmas fabric tissue box covers – put them in your customer area, with price tags, and be ready to sell a lot of them. If you’d like to see some that I have available already made up, check out my store at Etsy.com – I have some fancy Lace Tissue Box Covers and a wide variety of Fabric Tissue Box Covers. Regular price for the Tissue Box Cover Pattern is $4.95, but your price during this sale is $4.21. Download your pattern today and make some winter / Christmas tissue box covers to give to co-workers, friends and relatives – don’t forget to dress up your house this Holiday Season with one in every room!